It’s tempting to ask whether the writers were high when they came up with the concept for Dough, except that the film itself makes it clear that they don’t have a lot of experience in that area. (Note to screenwriters in general: Marijuana has a taste as well as a smell. Let’s retire the old “eating pot brownies without realizing it” trope.) Regardless, possibly in an attempt to circumvent clichés, the movie is an odd combination of them. It’s part cross-cultural drama, part stoner comedy, and part celebratory “elders are people too” movie, with a little ’80s-style “let’s save the rec center!” sentiment thrown in. Each of these elements is handled gently, and Dough makes smoking pot seem about as edgy as falling asleep in front of the TV. But while that may be good news for advocates hoping to bring cannabis into the mainstream, it doesn’t translate into a funny film. 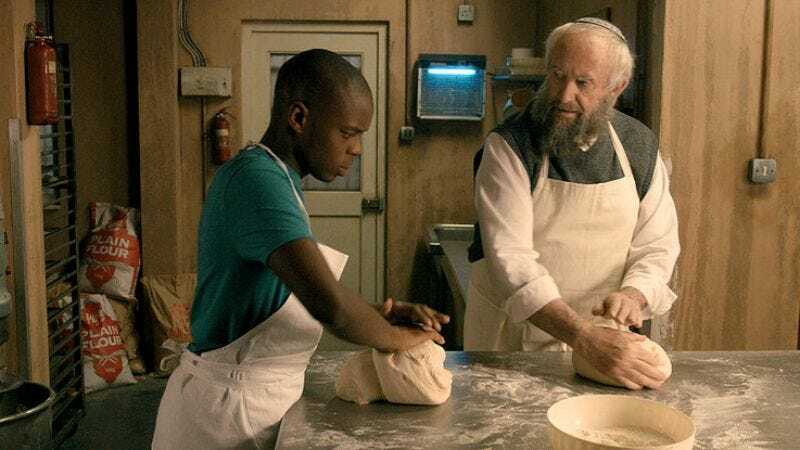 Veteran British actor Jonathan Pryce, in a yarmulke and what looks like a fake beard, stars as Nat, the aging proprietor of a kosher bakery in a rough area of London. Over the years, his customers have abandoned him for the shiny new supermarket next door, and soon his assistant does the same. (Cue montage of burning bagels and eccentric interviewees.) Meanwhile, Ayyash (Jerome Holder), a Sudanese Muslim teenager from the neighborhood, is getting pressure from basically everyone in his life—from his mom to the drug dealer he aspires to work for—to get a straight job. So, with a little assist from his mother, he takes over as Nat’s apprentice. At first, Ayyash, who doesn’t touch the stuff himself, simply sells weed out of the store to raise money to help his mom. Then a happy accident finds him dropping his stash into a batch of dough, producing challah that everyone absolutely loves for some reason they can’t quite define. Soon there are lines around the block—which must absolutely reek—for the kind treats. Meanwhile, cartoonishly evil developer Sam Cotton (Philip Davis) is trying to buy out the entire block so he can tear it down and build a parking garage. (Davis reaches peak ’80s early on, when he pretends to drive a toy car across a model of his sinister carpark, making little engine noises with his mouth.) Nat’s son, a prominent lawyer and unappreciative child of the sort you sometimes see in movies aimed at an older crowd, supports the plan, dismissing the century-old family business with a simple, “It’s just a shop.” But Nat is determined to save the bakery, even if it means cozying up to his sexually aggressive landlady Joanna (Pauline Collins, who at one point cries out, “I’m so lonely!” in a Pilates class like a living Cathy cartoon). This all sounds rather madcap, but the prevailing tone throughout the film is one of dripping schmaltz, enhanced by an overtly sentimental piano score that plays even over ostensibly comedic scenes. The script takes every opportunity it can to manufacture lessons about the importance of harmony between Muslims and Jews, and you can bet that any stereotype voiced by one of the characters will be disproven at some point. The preachiness adds to a general well-meaning but clueless vibe, like an elderly uncle performing a rap about staying in school for an audience of dumbstruck kids. Dough really does mean well: Pryce makes an excellent father figure, giving his scenes with Holder some real warmth, and who can disagree with an anti-racist message? But without any real laughs—and with a number of logical gaps, paper-thin supporting characters, and tired gags—ultimately viewers may feel like they’re just humoring the movie.